It's time for our AUGUST challenge, CHANGE OF HEART. 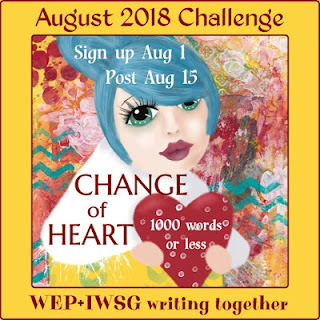 This month, we welcome writers from the IWSG (Insecure Writers Support Group) who are joining the challenge. 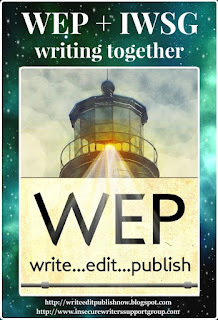 Some are already regulars and I'm hoping many more will become part of the WEP team as well. When would life become bearable again? He was taken, his life over too soon. The table was set, the fresh flowers smelt wonderful. Alice smiled. There was a time she thought she would never feel happy again. Everything was ready. The doorbell rang, right on time her guests arrived. Kisses on cheeks given and received, a flurry of activity ensued as the ladies seated themselves, placing handbags on the floor, muting mobiles. Then followed compliments about the table, admiration of the flowers on the table, the pretty tablecloth and the setting in Alice’s conservatory which was lovely and cool on this rather hot, summer’s day. The blinds were drawn halfway down the glass to keep the sun from baking everyone, the atmosphere was convivial. Freshly made lemonade poured from a carafe, ice cubes added, tea plates and serviettes handed out. Alice started slicing the home-made chocolate cake which was enjoyed by all with many complementary comments flowing from her friends. Hmmm, delicious, it’s so moist, love the chocolate flakes on top, to name but a few of the murmurings. She couldn't put it off any longer, it was now time for the informal writing group to get down to business. It was Alice’s turn, as the hostess, to divulge her writing. She’d chosen a piece she had written several years ago. She had gone through her diaries and notepads and painstakingly typed her handwriting on to the computer, checked it for spelling mistakes, grammar, tenses and context. A fight with the printer and a dash to the stationers to buy more ink for the mean-spirited machine at last enabled her to print out several copies. While she was at the stationers she had purchased four folders. She was taken with the pretty pattern on the A4 folders. It had an empty birdcage, an ornate mirror, a teapot with a handle, spout and lid and a tea mug, all interspersed with bird on branches and pastel coloured simple flowers. The design had really spoken to her, she was no longer held or imprisoned in a cage however gilded it might have been. She was now free. She was able to look at her reflection in the mirror without cringing at the image that stared back at her. She could indulge in tea (and cake) whenever she wanted to. The branches with a bird perched on them showed her there was always a new life to be had. She could be like the bird and fly wherever she wanted to. It meant freedom. The group of ladies settled down, all sated with refreshments, they relaxed against the plumped up cushions. Now came crunch time. Alice’s heart started pounding, she was sure her blood pressure was rising as she passed a folder to each of her friends. Would they still be friends after they read her words? Would they feel what she felt at that time? Would they think it was over the top? Would they actually realise it was based on fact and not fiction? Should she tell them it was fact or should she lie and say it was pure fiction? Alice disappeared to the kitchen and put the kettle on while she waited for her friends to finish reading and digesting, not only the food, but also the material she had written. As she re-entered the conservatory holding a tray with the tea things on it she noticed her friends were all holding soggy tissues in their hands, hands that were dabbing at eyes, throats were being cleared from the lumps congealing in them. She placed the tray on the coffee table and looked up to see Lilian looking at her, followed by Daphne gazing at her with Anita joining in the collective stare. Alice blushed as the heat rose up from her rib cage, covering her throat in a pink glow, moving up to her cheeks as her forehead glistened with a slight sheen. Her three friends stood as one as they moved in unison to stand beside her. They enveloped her in their arms hugging her tightly. Daphne placed a kiss on her brow, Anita rubbed her hand up and down her back while Lilian squeezed her hand in hers. Oh it felt so good to have friends. It felt so good not to be judged. It felt so good to be loved. It felt so good to finally let it all go. That was very emotional. I could feel her indecision/regrets that she'd shared her writing as she waited for them to read it. You show nicely how they all felt without them speaking. Very good job. The poem was and is especially very dynamic. It is filled with emotional tension. You did an excellent job of balancing it. How lovely to have supportive family and friends. And how wonderful to emerge from the concrete cloud of despair, stronger, taller, free. Very emotional, both the poem and the story. I understand why her friends are crying. She is fortunate to have such understanding friends. Sweet and emotional. Support can be an artist's best friend. I had to change my link on the sign up since it wasn't working. A lovely poem and story of renewal from loss. Portrayed well. It touches the heart. Sure can sense the rising emotion with each word. Having or not having that support can make all the difference. 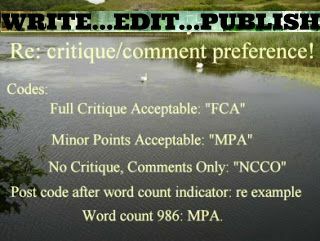 The anxiety about writing is common among writers, especially when it's autobiographical. It's rare to see a poem as part of the entry - that was lovely. Both the poem and the story can stand alone. Great job. I always find it courageous to write real life stories. I’d be terrified to show my friends a piece written base on true life events, especially one that leaves you vulnerable. I definitely felt her fear and bravery. Great job. There is so much about this I like. The poem and the story, the way they are connected, it's a delicate balance. It's wonderful how you show so much emotion without the friends saying a word. Plus, it's nice to see such love and support. Not everyone has that. A beautiful story. I was impressed by how the poem and the story manage to interweave without being overtaken by one another. I really like the words at the end about finally feeling good being loved and not judged and letting it go. What a combo! First the stage is set with the poem, then the finale with her leap of faith by writing about the emotional experience, and the result which will help her on her way. When others show they care, it softens the sadness. That's a beautiful poem and a wonderful story of friendship. It is hard to share deeply personal writings with friends, but it makes it better when they show kindness and understanding. Sally, I always love your deeply emotional writing and I love how you've combined a poem and prose to tell this story which I see is met with wonderful comments. I like the way you used both poetry and prose to set the scene. I don't think each would have had the same impact without the other! I like how you used both poetry and prose here, and your piece was filled with so much emotion. Thank you for sharing it with us. I love the poetry-prose combination which makes for a unique and refreshing perspective. As Deniz mentioned above, it's the blend that lends impact to your entry! An optimistic tale, showing a way forward. The poem was beautifully written too. What a wonderful use of the prompt. Very deep. Great stuff! Two emotional pieces, both heartfelt. What a wonderful pairing of the poem and the story, both of which really grabbed onto the heart and held on for dear life! That's very impressive. Great stuff. It’s a touching story, and yet you got in some of that humor that always crops up in life—I loved the bit about the mean-spirited printer! This was delightful! I loved the imagery. That was heartfelt and I felt I was in the room with the ladies. Well done!